It was love at first sight, smell and taste. My sensory affair with India began when I visited just over a year ago and I’ve been besotted ever since. 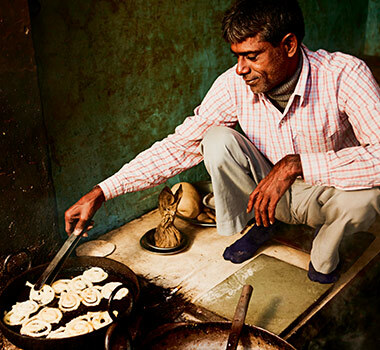 I was lucky enough to travel to India for the first time with Melbourne’s Epicurious Travel, experiencing a customised version of their ‘Indian Odyssey’ adventure. When I headed back six months later, I added a side order of Kolkata and opened my heart even further to the joys of this incredible country. One of the greatest sources of my adoration for India is her food, which is prepared with care and tradition after daily trips to the market. At our first stop, Delhi, breakfast is a revelation. There is the delicious simplicity of the masala omelette, featuring a creamy eggyness that plays with the acidic tang of tomato and the subtle heat of chilli. Then there’s the savoury melange of the breakfast masala dosai, a rice and lentil batter fermented overnight then fried and served as a long, crisp pancake roll stuffed with a spicy potato curry. Black mustard seeds, fenugreek and fresh curry leaves deliver a gentle punch in the potato, while the dosai is served with a colourful array of sambars and chutney that are like nothing I have ever tasted. The crunchy coconut sambar and spicy tomato chutney are unbelievably fresh with a lingering depth of spicy, exotic and addictive flavours. Chandni Chowk bazaar in Old Delhi is a crazy, mysterious labyrinth of narrow laneways that all seem to lead inwards, while its main drag is a frantic explosion of cars, trucks, taxis and trolleys, where vendors sell their wares with vocal abandon and a sea of people crush the pavements. In the depths of the market streets, fruit and vegetable sellers perch on their haunches, or lie resting, their fresh, bright produce by their sides. Young men push flat-bedded trolleys of melons, gourds and greens, looking for the next buyer. Fresh watermelon juice is pressed and loaded with ice, giving some relief from the stifling heat. Pots of oil splatter as they cook delicious jalebi – a saffron-tinted disk of pastry with hints of cardamom and rosewater that play with the lingering sweetness. 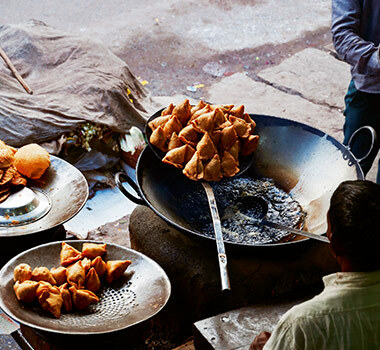 Vegetable samosas are the ultimate savoury street food. Potato and peas mixed with an array of aromatic spices: cumin, garlic, ginger, chilli and turmeric, their crisp pastry delicious and satisfying. We eat chicken kebabs fresh from the tandoor, strung onto metal skewers with onion and green capsicum, covered in a spice mix of cumin, turmeric and garlic, and served with a pot of bubbling dal. India has a love affair with dal, its shades and flavours unique to each region. In northern India, dal makhani features an array of dark beans and lentils flavoured with chillis, garlic, ginger, onions and unique spice mixes. When ours arrive, a knob of garlic butter has been placed in the bottom of the copper serving pot. The steamy dal is placed on top, its heat melting the butter and creating a lava-like explosion of flavour as its garlicky goodness infuses the beans. Rich, textural and highly complex, its lasting flavours linger in my memory. From Delhi, we travel by bus to Agra, enjoying the countryside, where villagers barter at their local market, tend their land and mend things. Indians can fix anything it seems – including our broken down bus – with garages and workshops in every town, faces and hands stained from the grimy work, the air heavy as the scent of automotive oil mingles with village life. 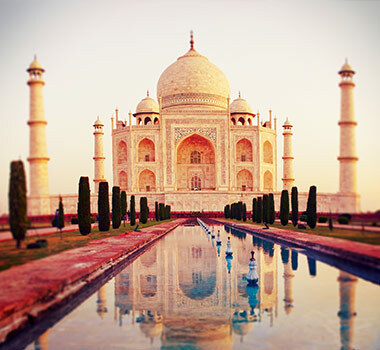 The ultimate monument to love, the Taj Mahal, is a sight to behold. Its majesty at sunrise breathtaking in its beauty, its painstaking construction a work of symmetry and wealth, the ultimate jewel in Agra’s – and India’s - crown. Next stop, Jaipur – the ‘pink city’, famous for its palaces and forts that circle and protect the city from their rocky, hillside outposts. We arrive in the middle of wedding season, the festival of love in full swing. Processions of newlyweds resplendent in their colourful and adorned outfits are followed by their ecstatic entourages as they make their way to the celebrations. Loud whistles, the banging of drums, the clanging of cymbals; the cacophony of bliss is everywhere. Watching the sunset over Jaipur from the top of the Nahargarh Fort, tasty morsels of chilli chicken and an icy Kingfisher beer in hand, the atmosphere is electric. As the sun disappears, the noise from the city below makes its way up the hill before the fireworks begin, heralding celebrations for the happy couples. Next day, a visit to Jaipur’s famous Lassiwala where the delicious lassi, made from milk, sugar, mawa (milk cheese) and baraf (ice) is served in earthen cups called kulhads. Established in 1944 and located on the M1 road, this place is an institution – for good reason. The memory of savouring its creamy, unctuous goodness on a boiling hot day remains. Sweet yet tangy, rich yet refreshing. The growing pile of discarded terracotta pots on the sidewalk a testament to its place in the daily life of the locals. For all the smart hotels and recommended restaurants I visit, it is an invitation to dinner in a private home that remains one of my most treasured food memories. I’ve been invited by Ateeq, who I met on my first trip to India when I visited Ranthambhore where he is a guide in the national park. 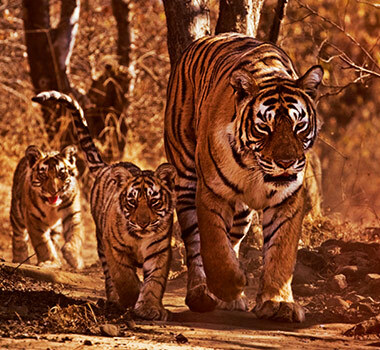 Under Ateeq’s expert guidance, we saw eight endangered Bengal tigers over three safaris, including a new mother and her two cubs. Ateeq is eager for me to meet his wife Nilu and see his new house. He and Nilu designed and built the house and their pride is obvious. On my arrival I’m met by a sea of faces peering at me. The whole family has come to welcome – and stare at - me as a great sign of respect. Divine. As I step into their home, the whole family watches my every move, saying nothing. My Hindi is non-existent, as is their English so Ateeq acts as our interpreter. Nilu has been to market to buy the meat for our istu – a curry made from male baby goat, a dish common in the villages around their town of Sawai Madhopur. Onion is fried until aromatic then mixed with a heady mix of garam masala. Black pepper and dried red chilli lend some fire, with yoghurt curd added and the goat simmered until soft. Chopped green chilli is added 15 minutes before serving, giving lift and freshness. The room swirls with the smell of baking bread as spongy, white naan is lifted steaming from the oven. A plastic mat is laid on the floor as Nilu presents the curry, rice and naan. The three of us sit and break bread as we enjoy this special meal together. We eat with our fingers as the family looks on, laughing as I struggle to balance the bread, rice and sauce of the curry. It is warm and welcoming and delicious. I will never forget it. From the tastiest kebabs at Chacha’s in Khan Market, Delhi to the incredible vegetarian street food at Soma in Mumbai, my food affair with India continues. The spicy yet sweet chilli crab at Trishna Restaurant near Mumbai’s seaside makes me yearn for more. The surprising saltiness of a green mango drink at Kewpie’s in Kolkata and the fresh sugar cane drink with lime juice, hand milled by a young man just near the Jain temple, are memories close to the surface. The sound of drums banging, signifying the sacrifice of a baby goat at the city’s Kali Temple a further reminder of the constant colour and movement that is India. Another great revelation is the frequency of Indian wine on menus, telling me this is a country in love with the culinary experience and all that goes with it. While India’s wine industry is still young, it is enthusiastic, has embraced international advice and encourages flying winemakers. Sitting on the wide hotel verandah in my last destination, the sweeping lawns and manicured gardens are fresh in the morning air as punkah fans squeak as they move from side to side. I reflect on the past days of India’s rich, colonial tapestry and think about its future as I prepared to return to mine. What I know is that I am in love and I was from the moment I glimpsed her vivid colours, heard the cacophony of her daily life, felt her calm, visceral energy and became part of the constant, seething movement of humanity. Not to mention my first taste of dosai – that was love right there. Kathy Lane travelled to India with Epicurious Travel, a Melbourne-based travel company that specialises in culinary travel experiences. The Adelaide Hills Off Train Excursion leaves Adelaide by coach and winds through the picturesque churches and laneways of the city before climbing up to the forest surrounds. More specifically, to the historic town of Hahndorf, which is one of the oldest surviving German settlements in the country. Walking the tree-lined streets of this picturesque village is like being transported to a movie set where quaint cafés, bookstores and galleries are the star attractions. You’ll be guided to Chocolate @ No.5, a tiny house that holds a veritable treasure trove of sweet treats that you can taste almost completely at your leisure. Owned by cocoa expert Alison Peck and chocolatier Sarina Waterman, these two ladies seriously love their chocolate. They breathlessly riff on everything from single origin Venezuelan beans all the way to what drives a person to stir melted cocoa all day and night. We guarantee you’ll never look at a supermarket stocked block of chocolate again. If cheese is more your thing, you can opt to be taken down the road to Udder Delights, which is famous for its softer-than-soft goat’s cheese. Owner and cheesemaker Sheree Sullivan speaks with such reverence for the process that you’ll almost want to pack up your city life and start your own dairy farm. The day closes with a stroll down the road to The Haus, a German-inspired restaurant where you’ll dine on all the bockwurst, bratwurst and cheese kranskys your stomach can handle, all matched with wines from the region. Safe to say that whether you’re a vino fan or a die-hard foodie, there’s something for you on the Indian Pacific – you just have to choose your side. It’s intense. It’s delicious. I wish you the best of luck. For more details on the Indian Pacific and Off Train Experiences , visit the Great Southern Rail website , request a brochure or sign up to All Aboard .